Our goal here is to provide you with the best under counter ice maker reviews possible so that you’ll have all the information you need to make an informed purchase decision. If you’re in the market for one, then you’re looking for three things; primarily: capacity, reliability, and price. A lesser, but still important factor is noise, but most of the best machines are relatively quiet. Also, a given is a relatively small footprint. If it’s small enough to fit under your counter, though, that’s automatic. The Scotsman Gourmet Ice Machine is an absolute masterpiece of a device. Solidly built, capable of producing an impressive sixty-five pounds of ice per day, and filled with all the features you’d expect, including auto defrost and overspill protection. Best of all, Scotsman is well known for having excellent customer service, and some of the company’s customers have been with them literally for decades. It produces crystal clear, restaurant grade cubes, and you can purchase an optional three or four year extended warranty if you’d like an extra layer of protection. The other under counter ice machines are all excellent, as you'll see, but each of them has some or other weakness or problem that knocked it out of the top spot. The great thing about the Scotsman is that it literally has no weak points. EdgeStar makes a broad range of quality equipment and their under counter ice machine is no exception. With a hefty fifty pound per day capacity and computerized controls, there’s a lot to like about the machine. It produces sheets of clear, cubed ice, and even comes with an ice scoop. There were two things we were less than excited about with regards to this unit. Neither are deal breakers, but they were the twin reasons this unit did not make our top pick. First, there’s no option to buy an extended warranty, which is fairly standard. Second, while it is capable of producing fifty pounds of ice per day, it only has a twenty-five-pound storage capacity. If you’re not using that much ice every day, this might be overkill. If you do require a high volume, however, this is a great unit to consider. The Marvel brand isn’t as well-known as some of the other brands gracing our list, but the machine is absolutely exquisite. Daily production is thirty pounds, which may be a bit light for some, but for the vast majority of people interested in under counter ice machines, this one will serve very well. The ice it produces is restaurant quality, clear cubes, and an auto defrost. 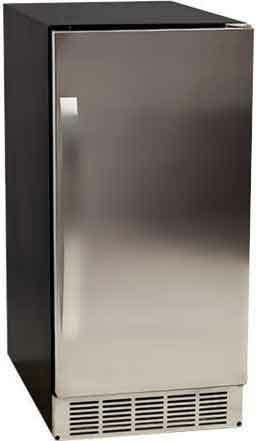 It’s also solid stainless steel, which some buyers will love. That also means it’s quite heavy, but the good news here is that once it’s installed, you won’t be moving it about, so the only time that will matter is day one. The only reason it didn’t make our top pick is its capacity. As we mentioned, thirty pounds a day should serve most of our customers well, but not all, and since it leaves some potential buyers out, we couldn’t list it as our top pick. See more of this Marvel Ice Maker... Click here. 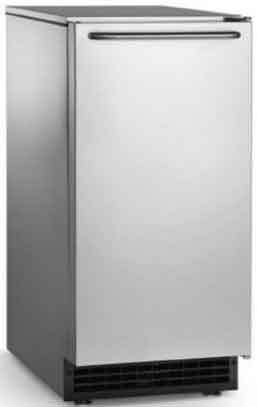 The Orien features a forty-four pound per day production and comes standard with all the features you’d expect in an under counter ice machine, including auto defrost and automatic overflow protection. 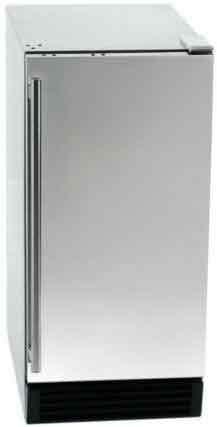 It’s the most environmentally friendly of the units reviewed here, with an air cooled condenser and it’s CFC free. Our only gripe about the unit is that Orien is known for having somewhat spotty customer service. Of course, you may be handy enough to repair devices like these yourself, so that need not be a deal breaker, but we couldn’t list it as our top pick for that reason. Still, it’s a solid, reliable machine, and you can buy an option three or four-year extended warranty to help further protect your investment. 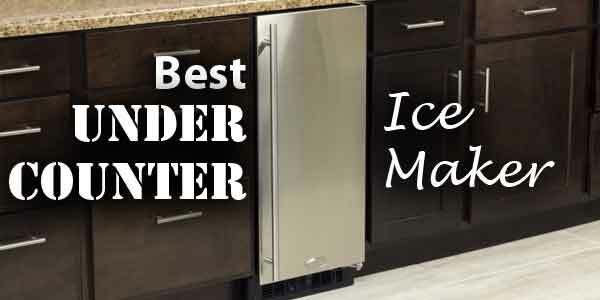 In reading our best under counter ice maker reviews, we think you’ll agree with our conclusion that while the others we looked at are all good, reliable machines, the Scotsman Ice Machine stands apart. It is simply best in class. 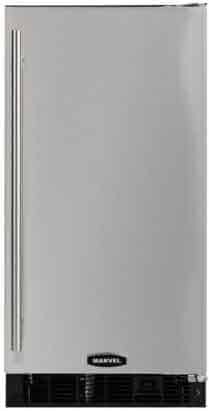 Click here to buy the Scotsman Ice Machine on Amazon!